anyone love this post as much as me – WhatZupBristol! 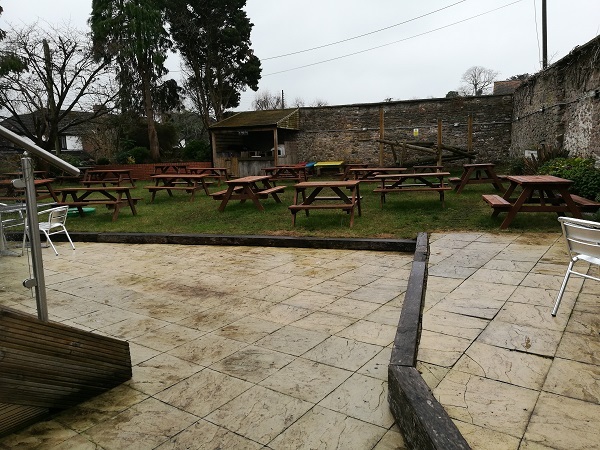 When The George in Abbots Leigh closed in early 2018, local residents were anxious that it would go the same way as other local pubs and be converted to flats or shops. Luckily, though, the community pulled together and two local businessmen bought the lease. The main pub itself isn’t a huge place, but it’s filled with community spirit. After you’ve parked (bear in mind there are only spaces for around 10 cars max), head in through the front door and you’ll find yourself enveloped in a warm and welcoming bar that – if our visit was anything to go by – will be rammed to the gills with single drinkers and diners, families, couples and dogs alike, all contributing to a great buzz. 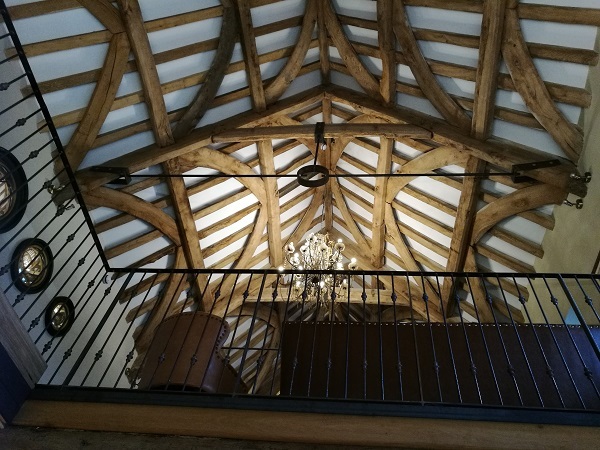 There’s an upstairs too, home to further seating and the most gorgeous beamed ceiling, with an intricate chandelier as its crowning glory. And in the summer months, the capacity of the place probably triples, with a huge garden complete with outdoor bar and pizza oven. Behind the bar at The George Inn you’ll find plenty of choice on draught, from lagers like Amstel, Moretti and Heineken to a couple of Thatchers ciders and ales that include Betty Stogs, Butcombe and Sharps Atlantic. There’s plenty of choice when it comes to bottles too, and the wine list is pretty extensive. On the food front, there’s something for everyone – no matter their tastes and dietary requirements. Our group of five included me (still trying to shift baby weight and occasionally making healthier choices) as well as a gluten-free vegan, and we were both pretty happy with the choices on offer. There are tons of veggie and vegan options on the menu, burgers can be served in gluten-free buns, and there’s vegan cheese for your pizza if you want it, too. And we ordered a pretty wide range. For me, it was the superfood salad (£9.50) with added smoked salmon (another £2.50). The kitchen team were happy to accommodate my request for the dressing (simply oil and balsamic) to be served on the side…but bizarrely, the salad wasn’t quite as advertised. 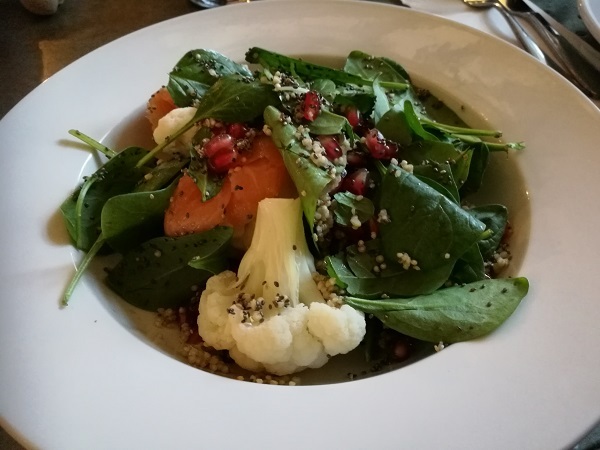 There was plenty of salmon (well worth the extra £2.50), and the spinach, cauliflower, chia seeds and quinoa that the menu promised were all there and in good quantities. The cauliflower was pretty raw – not a problem for me, but smaller florets would have been easier to manage. No sign of the tomato or kale, though: instead, a smattering of pomegranate seeds – and a few questions over the worthiness of the £9.50 price tag. Next to me, though, the beer battered fish and chips (£10.50) was a big hit. The batter was possibly a little overdone but wasn’t at all greasy, and cut through with a satisfying crunch to reveal perfectly cooked fish. The skin-on chips were delicious, the pea purée sweet and still with some texture, and the whole thing looked pretty damn good. Across the table, a Mediterranean vegetable panini (£5.50) with a small side salad and vegetable crisps was devoured without complaint, and the more awkward order of a vegan burger with added vegan cheese and a gluten-free bun was pronounced delicious. We loved the fact that the BS8 postcode hasn’t influenced the prices at The George Inn, too: the burgers and pizzas are all £12 max, and the most expensive main is an £18.50 8oz sirloin. Our meal for four with drinks (two of them alcoholic) came to just over £50 – an absolute bargain. The dog in our party was pleased to have a bowl of water by the front door to drink from, and the baby enjoyed chewing on the children’s menu before we sat him in a highchair and spoon-fed him bits of fish and pea purée. The service was super-friendly and really helpful – definitely a big selling point, too. 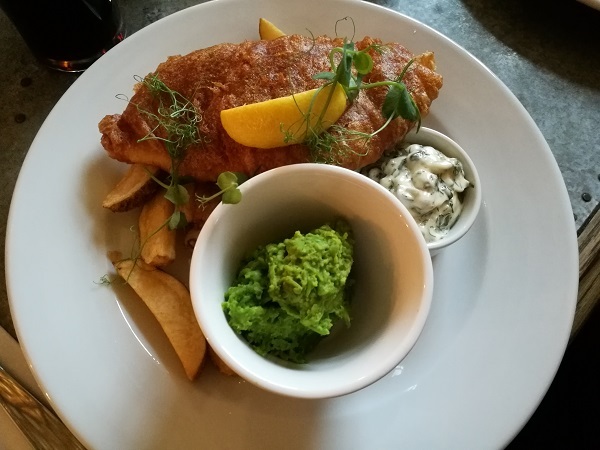 My main was probably the most disappointing part of the meal, but everything else was pretty good – we’ll definitely be back, and best of luck to The George Inn with its new lease of life! 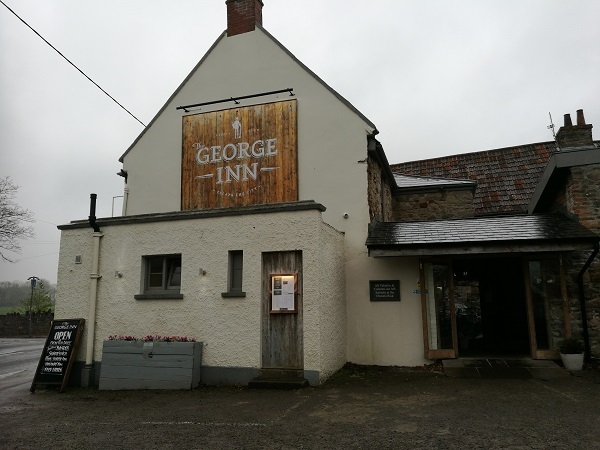 The post The George Inn, Abbots Leigh: Review appeared first on Bristol Bites. Next PostNext IMO posts about is great who agrees?